Badging on our fast muscle cars is as important as ever. Maybe more. We like to thump our chest when we have a Z28 or Mach 1 or other car with some symbol effects. Face it, wheel into a show with the Z28 badged on and you may get more attention than a regular Camaro. Now, the next step that should be the first step is the color. Pick the wrong color and you are doomed. Clearly if you pick a factory color you have yourself in a safe haven. If you go outside the lines you open yourself up to a heroes welcome or the wrath of Khan. Nothing would be worse than spending thousands of dollars of hard earned money and the end product falls flat. That is why so many stick to the traditional colors. For example, when I was searching for my Road Runner I would only look at cars with the correct paint so that the car would hold its value. What you might see as a great color idea the next potential buyer may need to barf and rethink the buying plan. Now, as we cross over to resto mods it seems the colors sway all over the place. I know we all desire our cars to stand out but going too far off the rails may bite you. One last example may be a 1928 Ford Model A. They came only in the color black in those days but restorers for years have been painting them beige, yellow, tan, and so on. If you are going for the original look one can only be assured that black is the color. 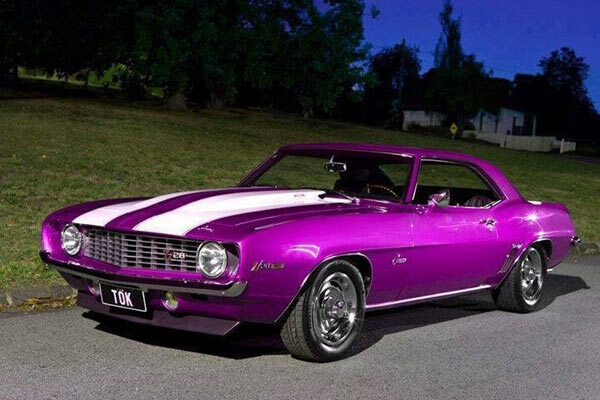 As for the Z28 in the picture I admit I like the plum crazy color. Just not on a Z28. Some colors just belong where they started. Lime green, Cuda, blue with white stripes- Z28 and so on. So as much as the paint looks fantastic on this Z28 I cannot bring myself to give it the nod. Remember we love showing our fast muscle cars. We desire the attention these cars bring. But, pick the wrong color and you might as well put in old picnic benches in for seats. In real estate it is all about location. In cars it is all about paint choices. With that I hope you pick the color you love and let’s hope that color fits in with what your car was built with. Not born. How can anyone dare paint a Chevrolet a Mopar color! Oh my goodness! Can I please have this car for a day and correct the paint? Serious buffer swirls….it could look stunning! !